Connor Fields Brings Home Gold For The USA In BMX Final from RIO 2016! Two Americans, Connor Fields and Nicholas Long, wasted little time in setting the pace in the men’s BMX cycling final on Friday afternoon. The two led the way through the turns and jumps on the Olympic course, with Fields making a late charge to win the gold medal in 32.62 seconds. 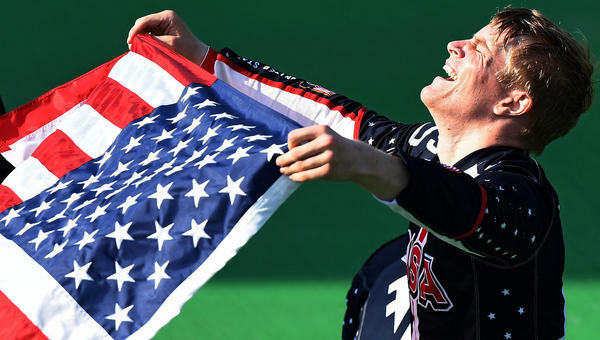 Fields, a 23-year-old from Texas, is the first American Olympic gold medalist in BMX cycling since the sport made its Olympic debut in 2008. Long finished fourth (35.52) after being edged out by 0.01 second by Colombia’s Carlos Ramirez. Jelle van Gorkom of the Netherlands won silver in 35.31 seconds. Fields’s win came just minutes after American Alise Post won silver in the women’s event.